Bruschetta is fresh and vibrant and tastes like summer! For the most part, we eat it straight on toasted Italian bread with olive oil the way it is intended, but we enjoy it so much that sometimes we eat it as a side with main dishes such as roasted or grilled meats and fish or pasta. Bruschetta is no fuss. It’s effortless to make and can be adapted to specific tastes easily. You’ll notice a range on some of the ingredients. Feel free to start small and go up. For example, I like a strong bruschetta so I’ll go a little heavier on the garlic and basil. You can use ingredient amounts as you please but I suggest always using Roma tomatoes. Other types of tomatoes will have more water, and I actually don’t like to remove the guts for bruschetta (I know this is a common practice) because I enjoy those juices with the toasted bread. Dice the tomatoes and add to a mixing bowl. 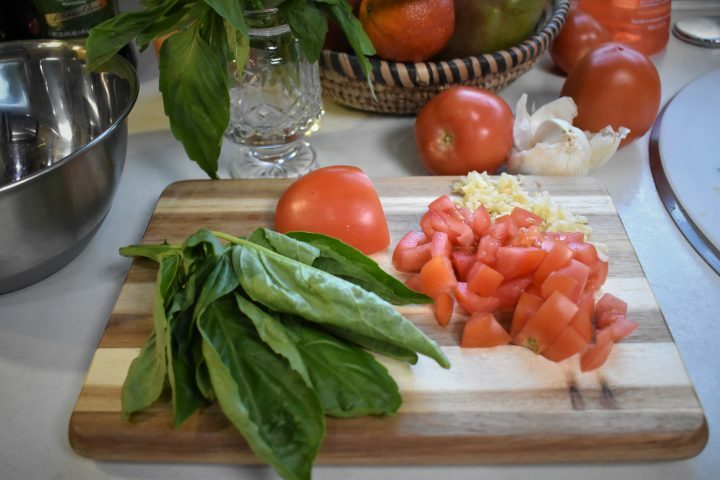 Finely chop your garlic and basil and add to the bowl along with the olive oil, salt, and pepper. Mix well. Slice the bread and place on a baking sheet, drizzle with olive oil and top with a little fresh ground pepper. Place the bread under a broiler for a few minutes until it is lightly toasted. And you’re done! Serve as an appetizer or if you like it as much as me alongside some of your favorite dishes and pasta. Mom, Wife, Content Developer, Foodie. Just a Jersey girl living in a Texas world...along for the ride. Yum! I love bruschetta. Thank you for sharing your recipe!